The Baked Stars range from Walkers were launched recently, aiming at a healthier market. They have 70% less fat as they are baked not fried, and come in small portioned bags, perfect for lunch boxes. 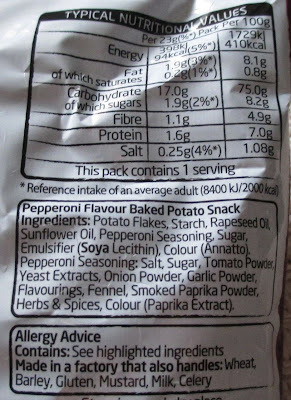 The range first launched with a selection of fairly standard flavours, but they have now expanded that to include this fab sounding Pepperoni variety. As I may have mentioned previously I do love meaty flavoured crisps so eagerly picked these up when I saw them in Tesco. I opened up the bag to have with lunch and found the smell quite enticing, it was quite rich and well seasoned. I tucked in and found the crisps to be nicely flavoured. The texture is nice too, they are a baked crisps, so a little thicker, but they do have a good crunch. They were meaty, and distinctly that of pork too. The spicy flavour had paprika, onion, garlic and even a sweetness from tomato that just worked really well. I very happily ate my way through the bag and thoroughly enjoyed these. I’ve added another multipack o the online order for next week as they tasty but healthier too, which is always helpful with summer on the way. 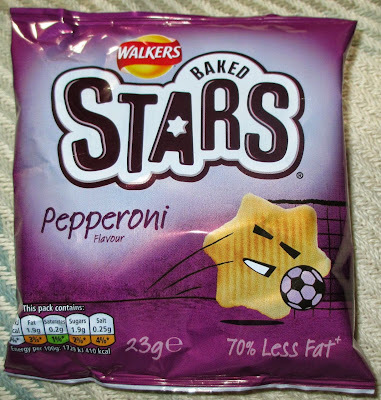 The packet clearly shows the ‘star’ playing football, which does make me worry that these are a limited edition for the world cup. All the Baked Stars bags show the ‘stars’ completing some fun activity, the slat and vinegar os singing, so maybe I’m just worrying over nothing? It would be a shame for these to be discontinued as they were my favourite flavour by far!